I ate my first Punjabi Chole Bhature only after I came to the US as it was a popular dish in most Indian Restaurants. Goan’s make something similar with split green peas and same deep-fried bread called Puri (bhatura). My husband had been saying he wanted to eat some Chana Batura for a couple of weeks till we had friends visit who said they had just eaten some. Feeling bad for him I decided to make it the next day for Sunday Lunch. 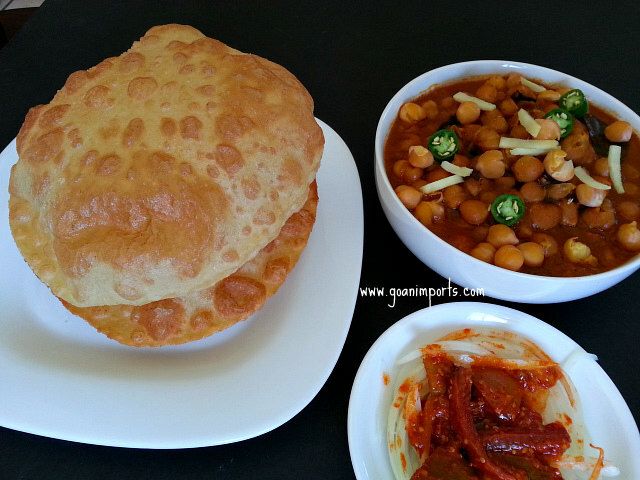 I did experiment with the Bhatura(puri/fried bread) using unbleached whole wheat flour. They turned out soft and puffy which surprised me since it was my first attempt at making them from scratch. The flip side, I did not keep a track of the measures. So I will have to share the bhatura (fried bread) recipe at a different time. It is a perfect vegan recipe. 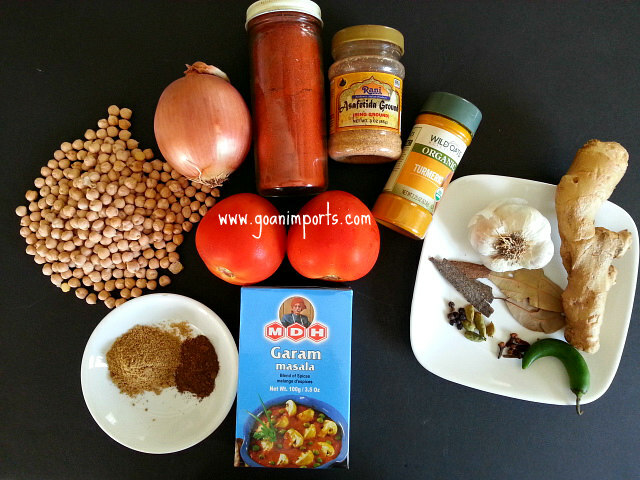 You can also substitute the beans with chicken and make an incredible Chicken Curry. This recipe may get you overwhelmed by the sheer variations in spices but trust me it is worth every bit. My fussy 5-year-old enjoys it every time I make it. You can skip the chili and it still has lots of flavor. Ps Note: This recipe is prefect for the home cook’s who likes to be in charge of quality control 🙂 I cooked my own beans using a pressure cooker. The reason I did that is because I came across an article that was published recently about cancer causing foods in America. Canned foods and excessive salt were named along with some more foods. If you are a new owner of a pressure cooker then you should add this recipe to your list. 2 cups dried chana/chickpea/garbanzo beans or 5 cans of low sodium garbanzo beans. Soak the chana/kabuli overnight. Drain the water. 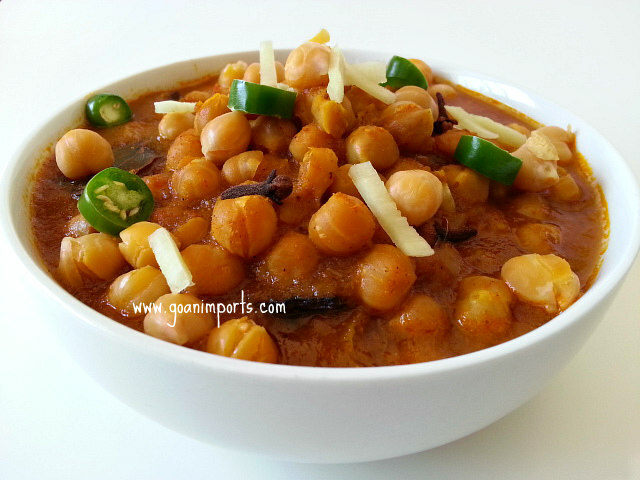 In a pressure cooker add the soaked chana, salt and enough water to cover the beans about 5-6 cups of water. Pressure cook for 6-7 whistle about 35-45 minutes. Grind the wet ingredients with no water. Keep aside. Heat oil in a separate pan. Add whole spices till the oil becomes fragrant. Next add wet paste and saute till the oil starts to leave the side of the paste. About 10-13 minutes. To this add the powder spices, saute for 1-2 minutes till it mixes well. You either can transfer the spice paste to the pressure cooker, add water, season with salt and cook it for 2 more whistle. OR If using the same pan add the water, salt and chana to the pan and cook for another 20 minutes on medium heat covered. Serve with hot bhature or with rice and a side of onions marinated with pickle. YUM! My absolute favorite and I often make it at home. I am a big fan of Indian food and their to die for naan. Thanks for the great recipe. I love garbanzo beans and the spices you use are terrific. This is on my “to make” list! I love the pressure cooker, but open-kettle cooking beans works very well, for those that don’t have a PC. Also canned beans work very well, as you mentioned. The difference I find between canned beans (legumes) and beans you soak and cook yourself, is in their texture. I find home prepared beans have a creamier texture, which is great for hummus, but for a stew, I prefer canned, because they hold their shape better. Canned fruits and vegetables get a rather bad rap these days, but it is worth noting that the nutritional value of canned, frozen and fresh vegetables are equal. And if salt is an issue, there are now “no salt added” canned products available. It is rather a luxury to have cans of beans on the shelf, at the ready. Great blog…I sort of want to make everything!! This is definitely a keeper! Thank You so much. i truly appreciate your kind words. Also Thank You for sharing your experience with canned beans. Specially the variations in textures something for me to note. This looks awesome! I love my pressure cooker! This looks amazing. I am definitely trying this out sometime. Thank you for sharing. You are very welcome Deb and Thank You! It looks delicious and healthy. You have a wonderful weekend. Please keep writing. Anxious for your next post. This seems awesome n authentic ! Definitly going to try ! Appreciate your kind words. Thank you! Oh this sounds amazing ! What a great recipe. I am on a huge veggie streak at the moment, so this is going to be fantastic. I definitely will be making this, and soon. Looking forward to your fried bread recipe…no pressure, I promise. Have a lovely week. In the pictures it looks like a puri. In Punjab puri is made from just atta/maida (plain flour) with water whereas the dough for bhatura is kneaded with curd and has some kind of leavening agent (baking powder) and sometimes egg in it. Some people swear in adding a mashed potato to bhatura dough but doesn’t work for me. Hence puris are thin and crispy and bhatura is crispy but has a more bread like thicker texture too. So do tell me which one you tried/try out! Thank you for pointing out the differences. I tried the puri’s recipe just atta , oil and water. I know what you mean about cancer causing foods. Pre-packaged foods and fast foods are nearly always terrible when you analyse their ingredients. I eat some processed foods and rarely eat fast food for that reason. Supermarket meat isn’t as good as that from a butcher, either. It can be horrific when you think of what you put in your mouth. It is always so much better to cook it all yourself. Good to hear that this recipe has the approval of both your husband and your five year old. Those will be the best critics. Thank you Harry. And yes, 5 years old’s are brutally honest in their opinions and taste. This looks absolutely delicious. Wow!! This sounds delicious! I have a pressure cooker, and love this type of dish. It would be perfect on a stormy day. Bookmarking this one! Thank you! I hope it’s a wonderful week-end. 🙂 I wish you the same. Very exotic and enticing recipe! You had BETTER share the recipe for puri. Thanks for the family photos. They look very happy. It’s that man again. Hey Hey Hey GIRL another INCREDIBLE RECIPE. The PUNJABI CHANA looks PHENOMENAL. Trust Me I love My CHANA/BHAJI PURI very much. Every time I go to Goa on holiday, I go the INDIAN RESTAURANTS for My CHANA and BHAJI PURI. I use My house in ALTO COMBA MARGAO-GOA as the HEADQUARTERS and then visit all the Indian joints as possible i.e TATO’S,BOMBAY CAFE and KAMAT’S to name a few. The last I was in Goa My friend Oscar Baretto took Me to another hotel called NANUTEL for some Indian food.Your FINISHED PRODUCT looks sooooooo palatable. I also like Your PURIS. Every recipe which You come out with has to be a hit. As always We will give this recipe a go. What a start to My weekend. And I am off for a birthday party today. A little bird tells Me that there is SORPOTEL AND BEBINCA on the menu. And I must admit, that I will eat like a GLUTTON. Thank You Mr Stan. Lucky you, to enjoy sorpotel and bebinca. I have to make my own 🙂 Nanutel is where I had my engagement party. It was a fairly new hotel then. Kamat, Tato’s and Bombay cafe are still going strong after all these years. I don’t know if you remember “Marliz” they were famous for their patties before “Jackris”. You and Mrs Stan have a great weekend. I remember MARLIZ very well. I think everybody in Salcette know about it. But I was told that it is not running any more. That to Me is such a TRAGEDY.We had a ball of a time at this birthday party. I did not have sorpotel in years, I almost forgot how it tasted like.The clocks in the UK went back by one hour.So We had an EXTRA HOUR in bed. Now You take care and look after Yourself. That is awesome Mr Stan. Our clock moves back this Sunday. I am not a big fan of the clock moving. Have a great weekend. This looks so yummy, I got super hungry now! Thanks for sharing this recipe. This looks and sounds delicious. Especially the bread. Love bread. LOL. Nice work, Nandini! Hugs. 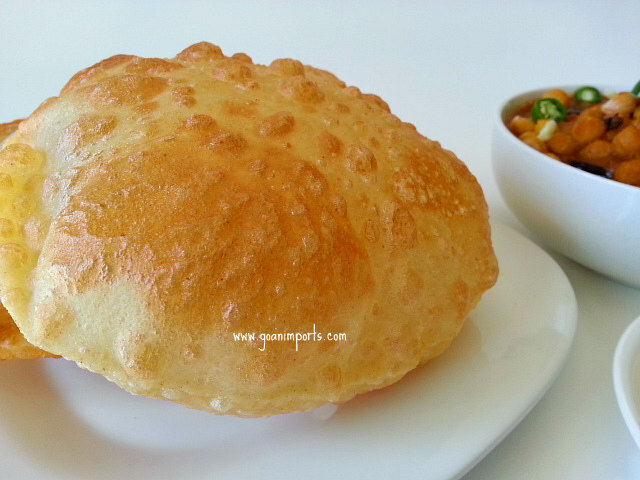 Lovely chole bhature and yours looks amazing! 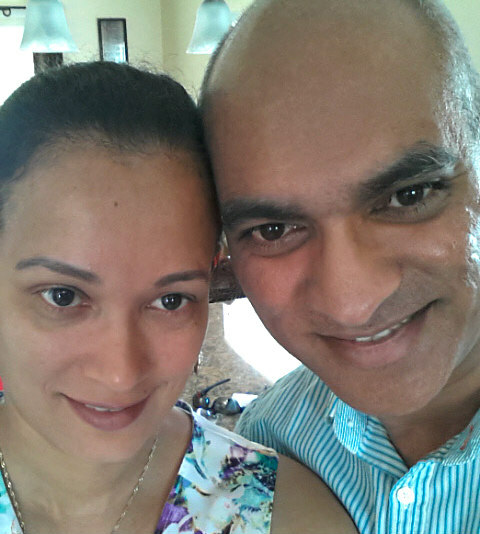 Dear Nandini, just saw your post to discover we both cooked a chickpea curry. Although we are on different continents we are thinking alike and felt like a curry. I had to have a chuckle. Have a wonderful weekend. Looks so good with all those interesting spices! And that bread….if it tasted half as good as It looks, it would have been amazing! Fantasatic! I applaud your dedication to non-canned food! I love garbanzos. Will make this soon. I love this recipe Nandini. And…you two are a lovely couple! Have a great weekend my friend. Enjoy the weekend too Nandini!! !